Shanghai Jiao Tong University’s engineering building stands proudly today and is another reminder of architect Laszlo Hudec’s lasting Shanghai legacy. Standing on the campus of Jiao Tong University, the steel-and-concrete lab building designed by Hudec has a simple Art Deco facade. 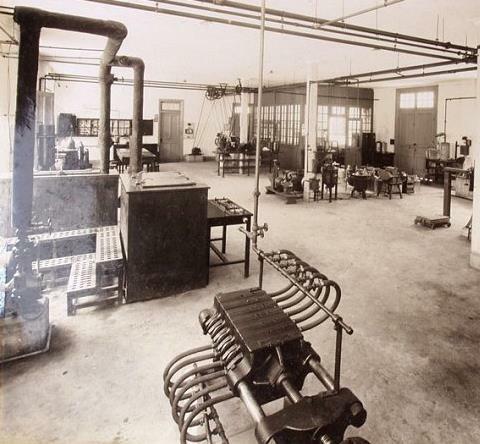 A sandalwood box was buried under Shanghai Jiao Tong University’s new engineering laboratory building on May 2, 1931. The box, similar to today’s time capsule, contained a three-dimensional photo of Laszlo Hudec’s drawing for the building, the complete works of Dr Sun Yat-sen and several newspapers covering the ceremony of laying the building’s corner stone. “The sandalwood box showed the university was proud of this building, which was one of several modern structures added to the campus during the period,” says professor Cao Youngkang, chief architect of the building’s 2010 restoration project. Cao found out about the box while reading an edition of the old campus newspaper, Voice of Nanyang. Tongji University professor Hua Xiahong, who authored “Shanghai Hudec Architecture,” says most people don’t realize the building was designed by Hudec. “Hudec even drafted an overall plan for the extension of the Xuhui campus,” Hua says. According to her research, Hudec received the commission for the project after doing a favor for Sun Ke although this could not be independently verified. Hua says Sun Ke had asked Hudec to sell the house the architect was building for his own family on Columbia Road (today’s Panyu Road). Hudec agreed to sell it at a low price and built another home nearby for his family instead, which is today’s Hudec Memorial Hall. On February 14, 1931, Sun Ke attended the ceremony to lay the building’s foundation stone and spoke about what a pleasure it was seeing the university produce young men who would serve their country. “During the last two years, plans have been drawn up for the development of Chiaotung (Jiao Tong) University on a reconstructive basis. It will be a unique engineering laboratory building in the history of education in China,” he said, according to a report in the English newspaper North-China Sunday News. The three pointed arches on the north entrance reveal Hudec’s preference for a Gothic style. The large yard in front is where students enjoy reading. 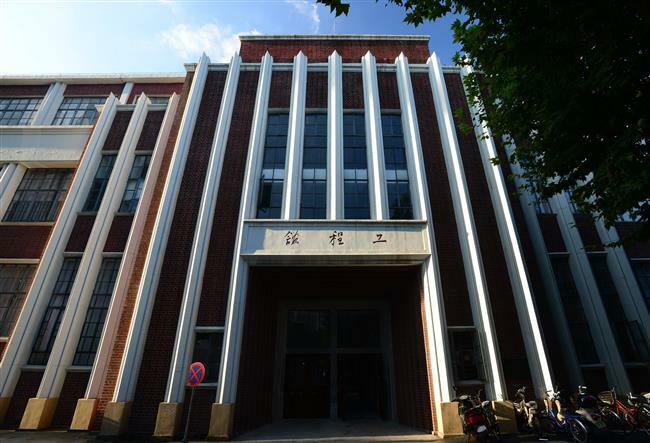 The building, which cost US$500,000 at the time, still stands on the campus of Jiao Tong University. It was constructed by Voh Kee Construction Company, Hudec’s trustworthy collaborator on an array of projects including the Park Hotel. Enclosed by walls with a large yard inside, the steel-and-concrete lab building has a simple Art Deco facade. The external walls are made with dark brown Taishan bricks. The edged stone pilasters stretch beyond the walls, emphasizing the vertical lines. The facade resembles one at the True Light Buildings, also designed by Hudec around the same period (introduced in the previous Bund column). The cantilevering doorway on the south side forms a thick shadow. The three pointed arches on the north entrance reveal Hudec’s preference for a Gothic style. During a field survey for the restoration project, Cao says he’s impressed by the simplicity of Hudec’s selection of materials. “He built with extremely simple materials, only cement mortar and Taishan bricks,” says Cao, who heads Jiao Tong University’s International Research Center for Architectural Heritage Conservation. 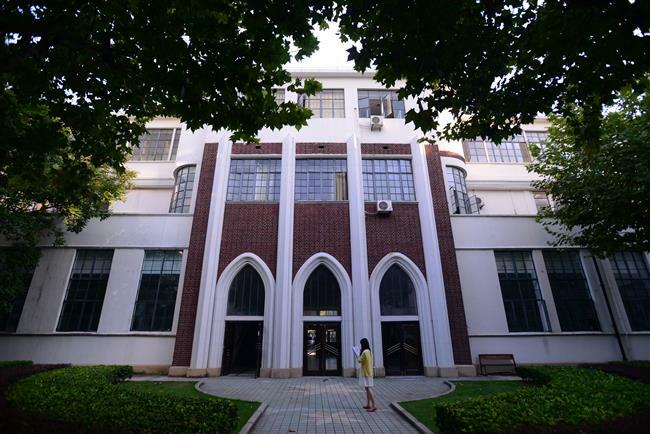 He is also leading an in-depth survey on 13 historic buildings at the university’s Xuhui campus. “But he added in so much detail in simplified classic or modern styles, such as architraves made from cement mortar at the entrance and numerous acute angles on pilasters and windowsills. They all look beautiful and harmonious with the whole building,” he adds. Cao also calls it a “very functional building.” Perched on the two sides of the hall are two grand staircases dominating most of the space. 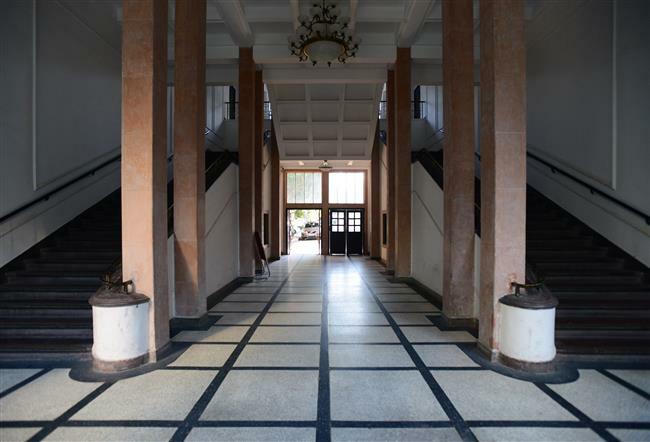 The corridors are as wide as three meters and are designed with terrazzo benches on one side along the wall. It results in a serene, quiet atmosphere for studying. The first floor formerly featured a boiler room and laboratories for mechanics, hydraulics, metalwork, material science and biology. Classrooms, drawing rooms, reading rooms, toilets for the professors, a darkroom for photography and two lecture halls were all on the second floor. This archive photo shows the first floor, whose high ceiling and ample space were designed for large-scale lab machines. When the building was completed in August 1932, it was first used as an industrial exhibition hall since the university was about to host the 3rd Exposition for Engineering and Communications in the spring of 1933. The report also quoted J. Usang Ly, president of the university at that time, who said China had not had much opportunity to develop in the fields of industry and education. The exhibition would aid this materially, giving the students a chance to see the practices behind the theories, Ly said. The show also included Chinese arts and dramas and a narrow gauge railway, on which a small train holding 12 persons wended its way about the grounds. Later that year two Nobel Prize winners, Italian physicist Guglielmo Marconi, who was celebrated for his development of the wireless telegraph, and Danish physicist Niels Henrik David Bohr, visited the building and gave speeches. The building was renamed Gongchuo Building in 1947 in memory of the university’s former head Ye Gongchuo, but reverted to its original name after 1949. Another floor was added to the 2-story building in 1960, which increased the building area from 11,000 to 13,000 square meters and ruined Hudec’s original proportions. During restoration work in 2010, Cao’s team used special techniques from the Germany-based Remmers Company to restore the Taishan bricks on the fa?ade. They also carefully maintained all the plaster architraves on the walls, which feature rare acute angles. During the restoration, Cao says he was not able to find out where the sandalwood box was buried. But after pouring over campus archives, he discovered an article written by the university’s former president, Tang Wenzhi, shortly after the engineering building was completed. His wish came true to some degree. Numerous Chinese intellectuals later studied in this well-designed building, including missile and space scientist Qian Xuesen, who graduated as a mechanics major in 1934, and former Chinese President Jiang Zemin, who graduated with a degree in electrical engineering in 1947. Listen closely when inside. You may just hear the echo of the words spoken by Sun Ke and Tang in this bastion of science, a place where it is hoped the sweat of the young will keep pushing China to greater heights. Built with simple materials, the engineering building is functional, which creates a serene, quiet atmosphere for studying. Tips: The building is open to the public. Also visit the other historic buildings on campus, including the old library built in 1919.